Hundreds of government employees gathered outside a courthouse in downtown Washington on Wednesday to protest President Trump's executive orders that changed the rules governing the federal workforce, calling the measures an assault on the civil service and a threat to democracy. 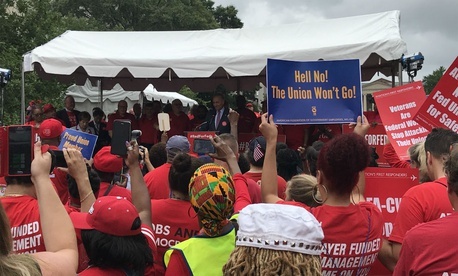 Workers, union representatives and lawmakers rallied behind the cry of Red for Feds, with protesters draped in the color to show their collective support. A federal judge on Wednesday was set to hold the first hearing in a consolidated lawsuit brought by more than a dozen labor groups representing federal employees, challenging the constitutionality of three executive orders Trump signed in May. The orders seek to streamline the firing process, exempt adverse personnel actions from grievance procedures, speed up collective bargaining negotiations and severely limit union employees’ ability to conduct representational activities while on the clock in their federal jobs. Speakers at the rally said the pending fight against the Trump administration was an existential one for the federal civil service and their unions, but expressed optimism their side would prevail. Employees from agencies across government gathered at the event, holding signs that read “EO hell NO” and “These executive orders are illegal!” The crowd chanted “red for feds,” “we fight for workers rights,” “vote them out” and even “lock them up.” An array of Democratic lawmakers spoke at the rally, including leadership in both the House and Senate. Sen. Bernie Sanders, I-Vt., said Trump has not followed through on key promises he made in the run up to his election. Del. Eleanor Holmes Norton, D-D.C., said Republicans were using a “two-fisted approach” to attack the federal workforce through both legislation and executive actions. Lawmakers and the protesters made clear they would fight back, through lawsuits, union organization and mobilizing voters in the upcoming midterm elections. An FLRA representative this week told AFGE and Education that there is “sufficient evidence” to charge the department with violating its statutory requirement to bargain in good faith. Any FLRA ruling will likely come without teeth, as the agency can only issue a judgment that carries weight if the case has been vetted and brought forward by its general counsel, a position for which Trump has not nominated a candidate. While the findings are only preliminary, and Education’s alleged violations occurred prior to Trump’s orders, AFGE said they served as a warning shot to federal agencies across government against implementing the executive actions. Such implementation has already begun, as the Office of Personnel Management earlier this month issued guidance on how to implement many of the provisions of the executive orders. Several agencies already have taken action to restrict employees’ ability to use official time, frequently circumventing the renegotiation process suggested in the orders. Unions representing employees at the Social Security Administration, the Veterans Affairs Department, Housing and Urban Development, and the Bureau of Prisons have all reported management actions to unilaterally restrict the use of official time or to evict unions from agency office space. The lawsuits were brought by AFGE; the National Treasury Employees Union; and the Federal Workers Alliance, a coalition of 13 smaller unions. If the unions are not successful in court, the Democrats speaking at their rally already have a plan B in mind. Erich Wagner contributed to this report.